This more modern, sporty styled cruiser was designed by John Welch. The hull is a medium V with shallow keel and three spray rails running along either side. The bow is slightly flared to deflect spray. 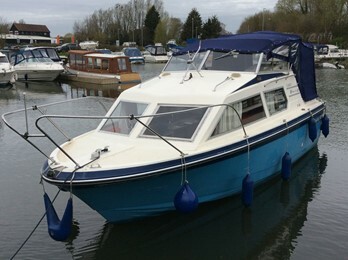 This open plan 4 berth cruiser was introduced at a time when the marine market was failing and only 20 boats were built. Most craft were powered by Volvo petrol/outdrives 120/145a models and D21 diesels. Some twin petrol versions were also produced.